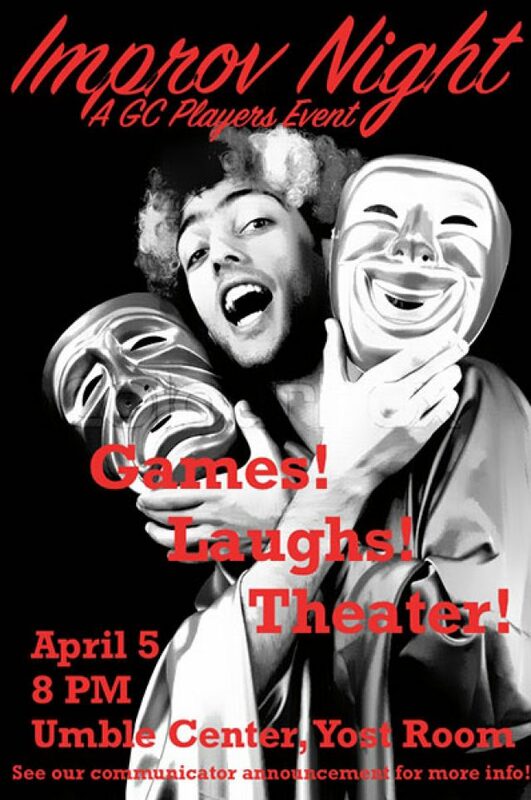 The GC Players’ final event of the season, Improv Night, is coming up this Friday, April 5 at 8 p.m. Everyone is encouraged to make their way to Umble Center’s Yost Room for snacks, socialization and the chance to try out improv for themselves. It doesn’t matter how much experience one has with improvisation. People of all levels are welcome. It’s an event for someone who wants a stress-free introduction to theater or a seasoned actor who wants to spend more time doing what they love. Improv Night is an event designed to practice improvisation skills. If something goes wrong onstage, it’s up to the actors to improvise and make sure the show still goes on. But this event is purely for fun and games. During the event, members of GC Players will lead participants through various improv games, which are enjoyable for both performers and audience members. There isn’t a script; participants make things up as they go and everyone else goes along with it. Similar to the games found on the show “Whose Line is it Anyway?”, Improv Night will feature a variety of games that provide actors with a prompt that they have to respond to by creating some kind of interesting, often amusing performance. Cristina Jantz, a junior and the treasurer of GC Players, said that the unpredictability of it all is her favorite part of improv. She also said that the event such a success because anyone can do it, regardless of previous experience. She noted that students from many different majors attended the event last year, and the turnout was impressive.